First things first, I love the program, you've done great work. My only issue so far is with the secondary option for right click. I've gone through all my settings with Wacom and still cannot correct the issue. When I try to draw in PyxelEdit, my pen is constantly trying to use the secondary option. Is there a way to turn off the secondary option? Because I can only choose between the three presented to me. (Eraser, 2nd color, or pick color). Unless I'm missing something, it unfortunately makes using a Wacom tablet with PyxelEdit impossible. Perhaps PyxelEdit simply uses the Wacom input as touches, so if you hold the touch for a second it will do a right click. I turned this off in windows settings. Disable it under Setting -> "Change touch input settings" -> Settings -> Enable press and hold for right-clicking. I use a touchscreen, myself, so this worked for me. Does this work for you, also? Dude, this fixed some many problems. I really appreciate the time you took to answer my question. This seems to still be an issue for me even with windows settings disabled. Windows 10, Wacom5 XL. I have disabled all buttons in the Wacom settings as well. On long press it will select the color of the pixel I am trying to draw on. so far... this seems to work. /\ the above is in the wacom settings. From Windows I was not able to completely turn the obtrusive touch settings off. Since I have clicked this off I have had NO ISSUE S in Pyxel Edit. Shamelessly Necromancing this thread, since this is still a problem, the solution is still valid, and this is one of the first Google results for the search terms: "pyxel edit wacom". Dude, I just found this, my own forum post, while Googling another problem with my Wacom tablet, and I found your post, HomeWorldArts. I was just about to give up on using my tablet and had switched to my mouse, and your last post completely solved my problem. Thanks for taking the time to post your solution for others. 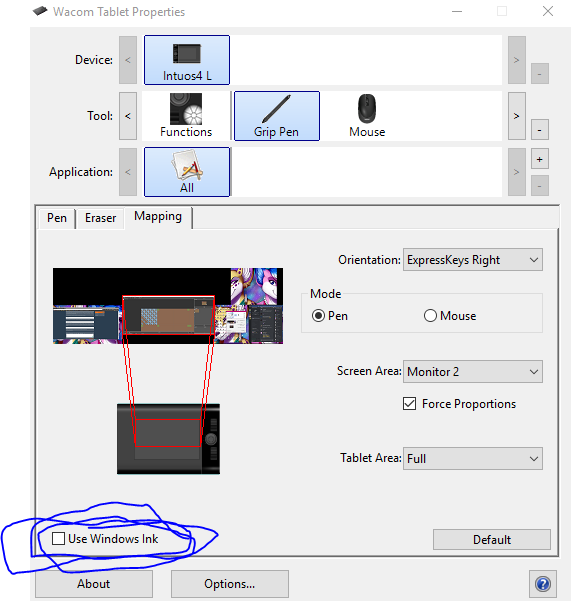 In orientation settings of the desktop centre for your tablet there is a check box for using windows ink, make sure this is not selected. I have a large size XP-Pen DECO 03 and small Wacom intuos pro drawing tablet without screen , Windows Ink and XP-Pen drivers play nice together .